Tharros is one of the most visited archaeological sites on Sardinia. It overlooks the Gulf of Otranto near Oristano on the west coast and is easily accessible by major roads. Tharros was founded by the Phoenicians in the 8th century BC on the site of an earlier nuraghic village called Su Muru Mannu; thus, from very early times, there is a direct line of habitation by the nuraghic dwellers, Phoenicians, Carthaginians, and Romans. The site was abandoned in the 10th century AD in the face of Saracen incursions all along the Sardinian coasts. The site was subsequently used as a quarry. update March 2011: As of January, 2010, nearby Oristano is the site of the facility for the University of Sassari's new 2-year post-graduate specialization program in underwater and coastal landscape archaeology. The latest copy of the UNESCO list of Courses in Underwater Archaeology at Universities and other Institutions lists 47 such programs in the world, 7 of which are in Italy. 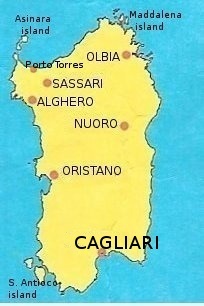 The Sassari/Oristano one is the only Italian post-graduate program in the field, although other universities and technical schools have undergraduate courses in marine archaeology as part of general archaeology degrees or offer classes such as "cultural heritage focusing on archaeology of the sea."